Seeing new places from the air is always an interesting experience. If you're on holiday in Port Douglas or simply visiting for a while, the absolute best way to get an overall picture of this beautiful location is from high up in the sky. Most flying adventures focus on the natural features of the area. It's a true 'where the forest meets the sea' kind of place, with the World Heritage Listed Daintree Rainforest coming right down from the mountains to the shoreline, meeting the reef-rich ocean in a narrow strip of clean white sand. You'll only get a true sense of the scale of the place from the air, so viewing by chartered flight, hot air balloon or helicopter is the way to go. Check out our ready to go tours below, or for more ideas and flying adventure options, take a look at the Port Douglas Flying Adventures category in our directory. Take a scenic helicopter flight from Port Douglas over the Great Barrier Reef or a combination with the Daintree Rainforest. Fly high above two of Australia's greatest natural treasures -- enjoy magnificent views of the world’s largest coral reef, or views of the amazing gorges, rivers and rugged mountains of the World Heritage-listed Daintree Rainforest. You can choose from a 30-minute or 40-minute flight over the Great Barrier Reef -- or for the ultimate experience, take a 60-minute combined reef and rainforest flight. Our most popular ride from Port Douglas. After the reef & rainforest, a balloon ride over the Atherton Tablelands from Port Douglas is absolutely, the next best thing to do. Your morning tour includes your 30 minute Balloon Ride and Door to Door return transfers. Double the enjoyment! Balloon tours depart most days and include door to door transfers from most Port Douglas accommodation. This tour includes a one hour picturesque hot air balloon ride with coach transfers. Spoil yourself or surprise someone special. You will be picked up for a Private Transfer to the ballooning launch pad then take off for a one hour Balloon ride. Enjoy a gourmet breakfast at a local resort. Includes personal photo portraits. These exclusive flights from SkySafari will carry you over picturesque Port Douglas and its inspiring surrounds. All tours include local courtesy hotel transfers and informative in flight commentary from your pilot guide. These exclusive flights will carry you over picturesque Port Douglas and its inspiring surrounds. Enjoy the World Heritage listed Great Barrier Reef and The Daintree Rainforests and outback to The Great Dividing Range. 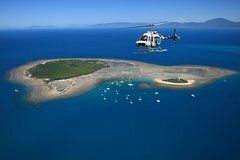 Choose from a variety of scenic flights that are coupled with amazing activities including flying over the Great Barrier Reef with scuba diving, landing on solitary sand cays and untouched islands, exploring the Coral Sea and more - click to see the whole range of scenic helicopter flights!